Like his fellow 2016 draftee Matt Krook, Oklahoma State's Garrett Williams features an impressive fastball and curveball from the left side. But in his debut season, he struggled to control his stuff and issued walks at an alarming rate, though not as alarming as Krook. Williams averaged just under five walks per nine innings in Salem-Keizer. With the fastball, Williams sits in the mid-90s and gets up to around 97 at times. The curveball is an upper-70s offering but is described as a "hammer." All from a 3/4 arm slot, Williams will need to refine his control and develop the changeup, which is currently the third of his three pitches. His walk rate has remained the same, around 10%, with Augusta in 2017, though he has begun to strike out more hitters and allow fewer hits. Hunter Cole seemed to have regressed since his promotion to Richmond last season, that was until he destroyed June with seven home runs and 10 doubles, culminating in a .653 slugging percentage. While teammate Austin Slater had success against Double-A pitching, Cole took a while to get into his groove, but finished 2016 slashing .271/.319/.420. Moving forward, scouts like Cole's bat speed and power, as well as his ability to play many defensive positions. In 2016, he played every spot on the diamond except shortstop and catcher. Lately, the injury bug has bit Cole and he's found it difficult finding regular playing time. Gio Brusa was one of two switch-hitting outfielders selected by San Francisco during the 2016 draft, and while Reynolds brings stellar outfield defense and a more pure-hitting style, Brusa provides the power. He won the Northwest League Home Run Derby in 2016 and finished second in the league (to his own teammate, Heath Quinn) in ISO with a .232 mark as well as fourth in slugging at .495. He struggled from the right side of the plate, slashing .219/.278/.370 but in half the amount of plate appearances. While still dealing with a small sample size, Brusa has improved in 2017 from the right side, rocking a .902 OPS through 61 plate appearances and striking out 8% less often than the left side. This Atlanta high school product was part two of the exciting middle infield in Augusta, Ga. for the 2016 GreenJackets season. 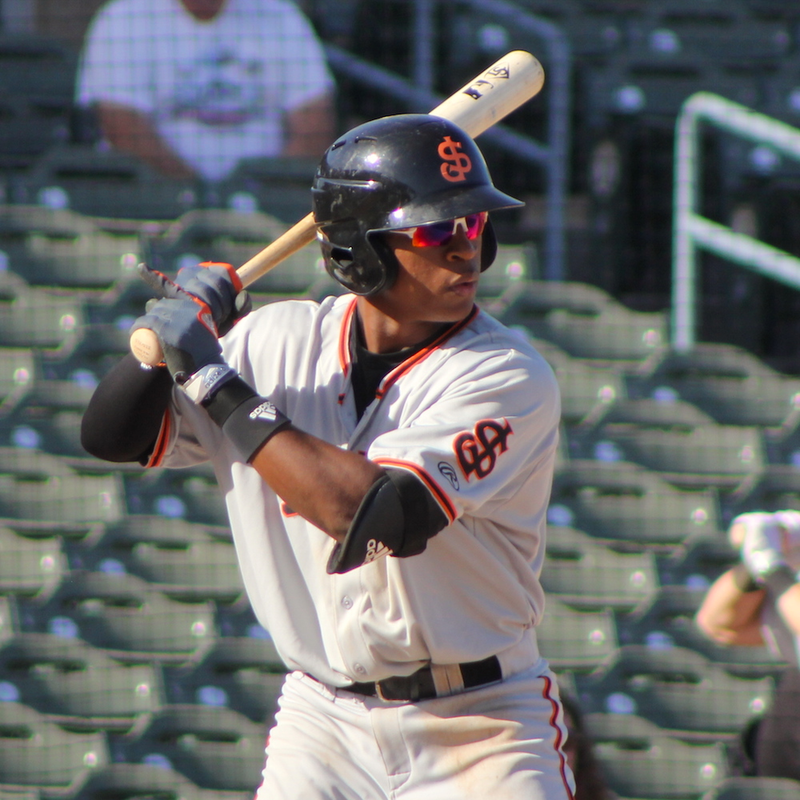 While Lucius Fox got most of the looks at shortstop before being traded, Jalen Miller could certainly get his chance to prove his worth there. Defense is generally the talk surrounding Miller, but he has a better bat than people give him credit for. During his first spring training, Miller but on display his strong hands and quick bat. He'll move through the ranks as a contact, gap-to-gap type hitter. His speed is above-average, and his range and arm strength are solid, but may become plus when a shift to second takes place. Seeking a chance for a breakout year in San Jose, Miller has shown speed, plate discipline, and occasional pop while running into some BABIP trouble.